We have a TeamCity Enterprise license for TeamCity version 9.0. 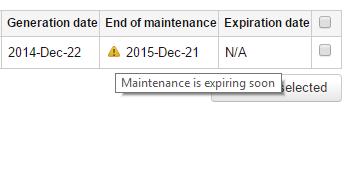 The end of maintenance date is 21 Dec 2015, and we are receiving a notification that the license will expire in 30 days. This is also shown in the screenshots. We will like to confirm that in case the license expires(which appears to be in a week's time), what features are going to be blocked? We know that TeamCity Support and upgrade will no longer be possible, but what are the other consequences(if any)? Will the TeamCity server run as normal until we renew the license some time after it has expired? Are there any penalties on renewing the license after the due date? When the license expires you won't able TeamCity support and upgrade the server, all functionality will remain and no features will be blocked. Also there are no penalties or fees. For more details see our Licensing Policy. Many thanks for the above info. I have a related question on a similar situation, but a little more complex. We have a TeamCity server running version 9.1.6 with an enterprise license including 3 build agents. This license has end-of-maintenance in 2 weeks from now and we would like to upgrade to TeamCity 10. Attached to the server are 20 additional build agents which are running on additional licenses which are already out-of-maintenance. So the question is, if we upgrade the server to TC10 would we be able to continue using the 20 extra agent licenses? or would we need new licenses for the additional agents? Or any other suggested solution for upgrading in this type of situation? Many thanks!